1 LEVEL town home with 2 bedrooms. 2 FULL sized beds with 1 sleeper sofa. Comfortable town home with a DECK and FURNITURE. MICROWAVE, DISHWASHER AND WASHER/DRYER. DIRECT TV. 65 channel cable with ESPN, CNN AND DISNEY. 2 TV'S with 1 VCR. No grill available. Hot Springs Village is a gated community located about 15 miles north of Hot Springs. 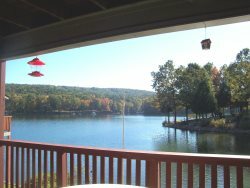 Enjoy golf fishing, swimming, tennis and hiking trails in the heart of the Ouachita Mountains. BALBOA GOLF COURSE AREA. DECK and FURNITURE. MICROWAVE, DISHWASHER AND WASHER/DRYER. DIRECT TV. 65 channel cable with ESPN, CNN AND DISNEY. 2 TV'S with 1 VCR. No grill available.